DESCRIPTION: D.S. 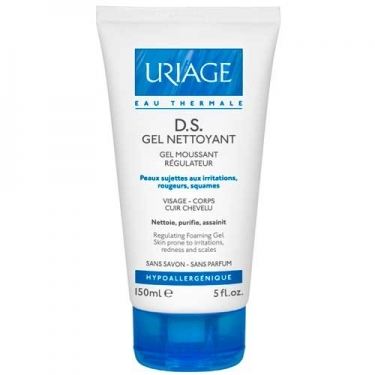 Gel Nettoyant Gel Moussant Régulateur from Uriage is an unctuous cleansing gel and ultra smooth. Its formula with Uriage Thermal Water, the patented complex TLR2-Regul, Piroctona Olamine, mild surfactants and protective agents, cleans, purifies and calms irritation. The result is a clean skin, purified and comfortable. It can be used on the scalp, as a shampoo. Hypoallergenic. No soap and perfume. 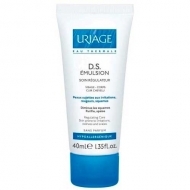 30% of Uriage Thermal Spa Water with soothing properties. Apply 1 to 2 times a day as hygienic gesture. Apply on wet skin until foam, leave act and rinse. It can be used as shampoo on the scalp, apply 2-3 times per week. Avoid direct eye contact. It can be used as shampoo for the scalp, to apply 2-3 times per week. Avoid direct eye contact.